As I'm sitting here writing the air is warm and the smell of onions is wafting through the air. I love this time of year. In just two days Spring will be here but today it feels like Summer. 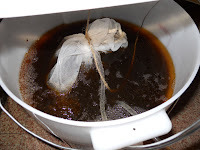 Last Friday night I started my first batch of compost tea. By Sunday it was ready to use. 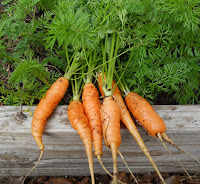 Mother Nature gave my garden a good watering on Friday and Saturday. Sunday I applied the compost tea. Within two days I could see the difference it made for the brocolli. They seem to really perk up. With the weather warming and more sun in the garden things are starting to grow a little faster. Photos below: Click on photos for a larger view. Early potatoes. I have finished hilling these up. From this point on I will just let them grow. Though I'm wondering if I can pinch them back if they start to get too big and wondering if I do pinch them back will it put more energy into the roots? I put the last set of boards on the mid season potato bin. They look so healthy. 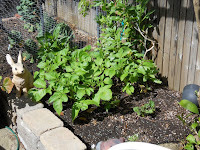 The main season potatoes are taking their sweet time. Hope this is a good sign. 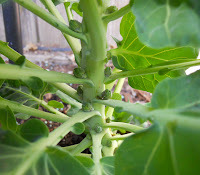 I've never grown brussels sprouts and I must say they are fascinating to watch. The leaf stems were tight and close to the main stem. Now they seem to be opening up. One of them is starting to flower. Don't know it that is good or bad. 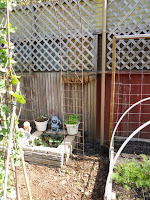 Still hoping I will get a harvest before I have to pull them to make room for the tomatoes. I have about four or five weeks before I need to get them planted out. I can pot up the tomatoes one more time before that. 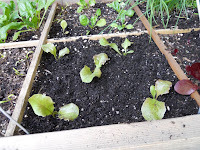 I started some lettuce seeds in the green house about two weeks ago. I couldn't believe how fast they were growing. 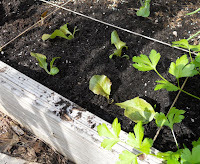 I had put seeds right into some of the beds and they seem to be growing so slow. So I replaced some of them with the green house seedlings. I think I will start lettuce in the green house from now on. 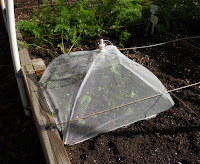 I love using these plate covers to protect my seedlings. I went to the dollar store hoping to get some more but they didn't have any. 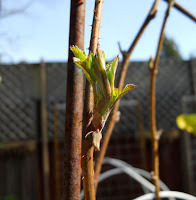 Photo Below: The raspberry canes are coming alive. 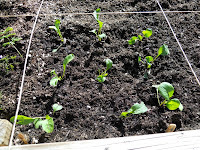 Photo Below: I brought the seedlings out Sunday morning to get some sun. I did lose three cucumber seedlings two days later. So now I'm debating if I should start more seeds in the green house or direct sow them right into bed 2. Photo Below: The sweet potato only had one large slip. The rest of them are not putting on much growth. I may need to order some slips for this year and do a better job starting my own next year... that is if I can even grow them. This year will be the test. Photo Below: I broke down and pulled my lovely purple vine out. I can't remember the name of the vine. It was shading the strawberry bed and most of bed 2. I did manage to pull a good size root ball and planted it into a pot for now. 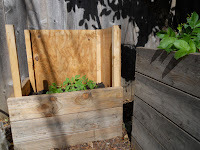 I will use the free space for a few pole beans. They won't get as thick as the flower vine did so the shading should not be a big problem... I hope. 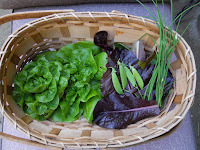 Also some lettuce, a few more peas and chives for last nights dinner. 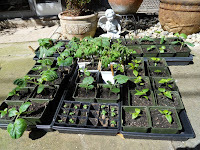 This weekend I need to get my pole and bush beans started as well as pot up a few more seedlings. Everything will get a nice deep watering. Your garden is growing so well! I love the little plate covers. I use them too as they fit perfectly in 1x1 square. Great pics! 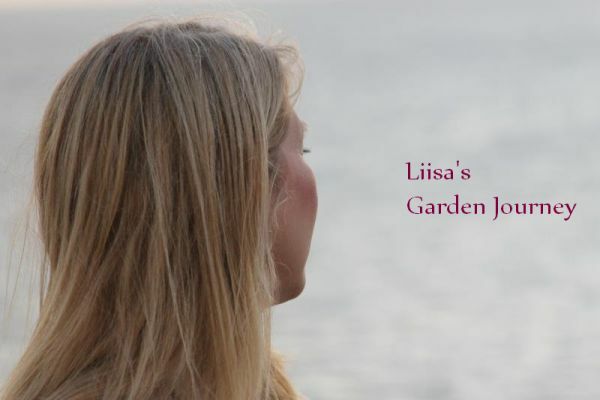 Your garden is looking fantastic! That's a good question about the potatoes. I've never heard of anyone cutting them back, but mine got so tall last year, I had to put a fence around them to keep them in their bed. Maybe I'll try trimming them this year. I never did find any of those plate covers last year. I checked every dollar store in the three cities. I'm curious to know about the potatoes as well. Seems like mine are growing too fast for their own good. I love using the plate covers too but I am also having a hard time finding them. I did an internet search and found them but they were to expensive. The cheapest one I could find was $1.79 on sale on one site, but you also have to pay for shipping. I'll just keep looking for them at the dollar store and hope they get more. The early and mid season potatoes really grew fast. If they get too tall for the space I will try and cut them back a little. Momma - Yes I used a bubbler. The tea is really easy to make. Just be sure to time it when you will have time to apply it. You only have about a four hour window once you turn off the bubbler. I did notice a difference in my garden a few days after I applied the tea. I will make another batch in April or May.